The transition from winter to spring is never easy for me. Although days are getting warmer, nights are still chilly. This makes it challenging for me to know -- not only what to wear each day -- what to cook each night. The weather's not cold enough for soup, chili or stew, but not warm enough for chicken salad, congealed salad or a chilled soup. Baked Spaghetti is the perfect compromise for those nights when Mother Nature can't decide if it's winter or spring. Baked Spaghetti isn't as hearty as my traditional spaghetti, yet it offers warmth on a chilly night via a delectable blend of spices. Most of my recipes have a story behind them and this one is no exception. Years ago, we belonged to a church that held a luncheon on the first Sunday of each month. Members would bring a dish or two to share and the congregation would eat together in the fellowship hall after the church service ended. The selection varied from month to month, but there were some dishes you could always except to see on the table: a two layer mandarin orange cake piled high with frosting; a big bowl of banana pudding topped with meringue; a pan of piping hot, perfectly seasoned, baked spaghetti. After enjoying baked spaghetti on more than one occasion, I found out who made the dish and asked if she would share the recipe. She graciously did but, like many good cooks, she didn't measure the ingredients. She gave me a list of what she put in the dish with approximate measurements and the method she used to put it together. I eagerly bought the ingredients and made the dish a few days later. My first attempt was good, but not as good as what she made. Over the next few months, I tried unsuccessfully to duplicate the recipe. My version was either too runny, too dry, too spicy or not spicy enough! The recipe was too good to throw away, so I filed it complete with notes and revisions in a recipe box with plans to cook it again at a later date. A couple of years later, a coworker gave me a recipe for a spaghetti casserole. As I read the recipe, I noticed how similar it was to the recipe for baked spaghetti, except it used additional ingredients and was only seasoned with salt and pepper. I was able to combine the two recipes, using the measurements from the spaghetti casserole with the assembly instructions from the baked spaghetti. Figuring out the right proportion of spices was trial and error, but I finally came up with a combination that pleased everyone in my family. If my version is too mild for your taste, you can add more chili powder and cayenne pepper; too spicy, decrease those two ingredients. Although the spaghetti is baked, the prep work takes more time than the dish is actually in the oven. To save time, I chop the vegetables and measure the spices ahead of time. When I'm ready to cook, I put a pot of water on to boil for the spaghetti while I brown and drain the meat and vegetables. Once the spaghetti is cooked and drained, I combine the ingredients in the same pot used to cook the spaghetti and let it simmer 10 minutes. If you want, you can add a drained 8 ounce can of mushrooms to the mixture. The mixture goes in a greased 3-quart pan and into the oven for 20 minutes. To make a cheesy version, add a cup of grated cheese on top before you put the pan in the oven. Whether you like a little bit or a lot of heat, add the cheese or leave it plain, baked spaghetti is a quick and easy pasta dish sure to please on a cold night. Cook spaghetti according to directions on the package; drain. While spaghetti is cooking, saute ground beef, onion and bell pepper in a skillet until meat is no longer pink and onion and green pepper are tender; drain. Combine all ingredients, except cheese, in a large pot and simmer 10 minutes. Pour into a greased 3-quart casserole dish; sprinkle cheese on top. Bake at 400° for 20 minutes. I love pasta, but Hubby isn't supposed to have them now. I may half this recipe and make it for myself. 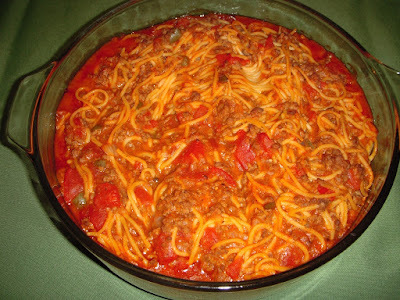 I would think the casserole form of this dish would let the flavors combine more than in the traditional spaghetti. This is definitely different from traditional spaghetti. It's not as heavy a dish and the blend of seasonings is completely different. I hope you enjoy the recipe! Thanks, Teresa! I hope you'll like the recipe. It's completely different from traditional spaghetti, both in texture and taste. Thanks for writing! This is a nice twist on the traditional spaghetti. Rather than sugar I would use ketchup to bring out the flavors. Hi Lita! Good idea! Depending on how much ketchup you use, you might be able to use an 8 ounce can of tomato sauce. The dish definitely needs sugar in some form to help cut down on the acidity of all the tomato products and the spices. Thanks for writing!